On February 4, the Chesapeake Bay Foundation in Pennsylvania applauded the state Senate’s overwhelming passage of Senate Bill 9 (Yaw-R-Lycoming), which would designate the Eastern Hellbender as Pennsylvania’s official state amphibian and clean water ambassador. Sen. Gene Yaw, Majority Chair of the Senate Environmental Resources and Energy Committee, is the prime sponsor of the bill. 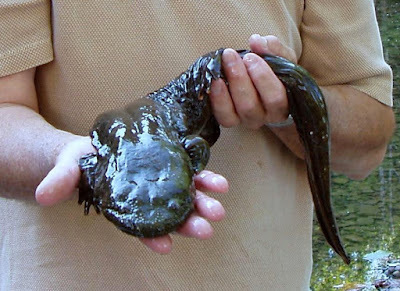 SLC students studied hellbenders extensively and wrote the first draft of a bill similar to Senate Bill 9 that passed the Senate last session, but languished in the State House. For more information about the campaign for the Eastern hellbender, visit CBF’s Hellbender webpage.